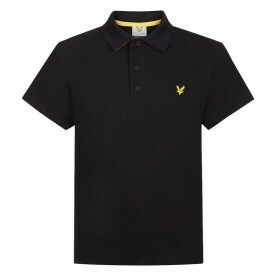 Lyle and Scott are renowned for their quality and fashionable golfing knitwear. The Bowmont V Neck jumper is part of their new Autumn/Winter golf performance collection. The jumper is made from 50% merino wool/50% acrylic mix. The finest merino wool mixed with acrylic yarn produces a very durable pullover which is guaranteed to keep the golfer warm on the coldest of days. The wool content helps to regulate the body temperature and it is also antimicrobial which allows the jumper to remain fresh throughout the round. The jumper also has a ribbed hem and cuffs for a more fitted look. The pullover is available in eight colours. This pullover displays the trademark 'Golden Eagle' logo which is synonymous with Lyle and Scott and is instantly recognisable with the brand.